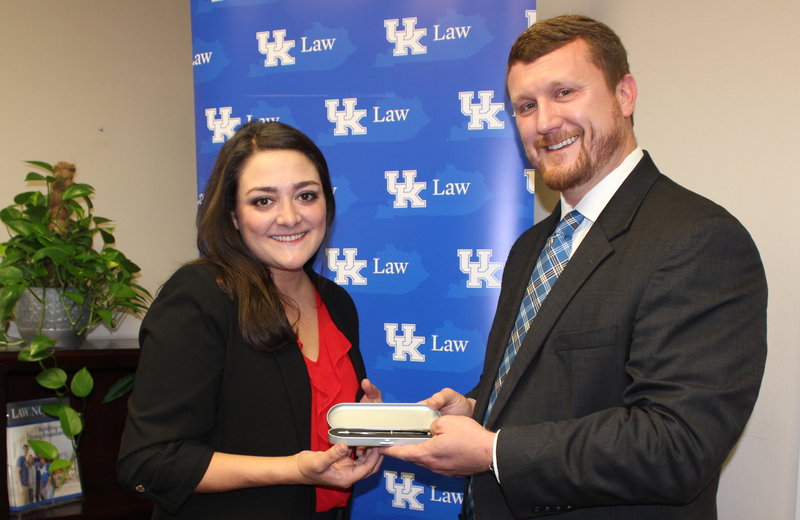 Third-year law student Julie Greenlee was presented with the Legal Aid of the Bluegrass 2018 Law Student of the Year award this month. Greenlee is the first UK Law student to receive this honor according to Josh Fain, Esq., Pro Bono Coordinator at Legal Aid of the Bluegrass (LABG). Greenlee, a Lexington native, has actively engaged in pro bono work. She interned with Legal Aid of the Bluegrass the summer between her second and third years of law school and continues to be active during this school year. “Just let me know what I can do” is a common statement made by Greenlee at the LABG office in Lexington, according to Fain. Greenlee’s work has varied from clerical tasks and client intake to in-depth research and writing projects. Greenlee said that providing pro bono assistance is not only a good experience, but also rewarding. “It’s nice to work with all of the wonderful people involved in pro bono work,” said Greenlee. The knowledge of law that is needed to navigate the legal system is powerful according to Greenlee, and she enjoys applying her knowledge and skills in a manner that helps others who are often engaged in life-altering situations. “Our profession is in good hands,” according to Fain. The event, hosted by Legal Aid of the Bluegrass and the Fayette County Bar Association Pro Bono Program, recognized additional awards including Pro Bono Attorney of the Year, Barbara A. Kriz, a graduate of UK Law. Legal Aid of the Bluegrass serves 33 counties and its mission is to resolve the most important problems of low income and other vulnerable people by providing high-quality legal assistance through direct representation, education, advice, advocacy and coordination with other community resources.